Why do people buy old tools? 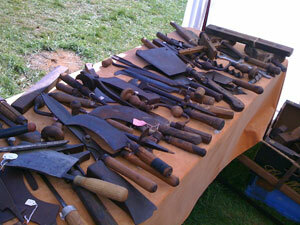 According to Ian Fraser, who sells hundreds of antique tools each year, they are mainly bought to be restored and used. Tools such as billhooks and draw knives can be expensive to buy new and often the older tools have blades which can be more easily resharpened. Indeed one of Ian's favourite hand tools is a portable scythe anvil (see photo below). This is a small anvil which could be carried in a rucksack and hammered into the ground so that when one's scythe or billhook became blunt of bent one could sharpen or straighten it out in the field or woodland. Ian's background is in antiques but he has made a specialisation of old tools for working in woods and for working with wood, though he also sells old gardening and kitchen implements. His policy is one of low pricing with almost all his tools priced between £5 and £15. If there is a particular tool you want you could email Ian at [email protected]. Or phone 07807 325299. Many of his tools are sourced from France where Ian mainly frequents "brocantes" (second-hand shops) in the Loire Valley. 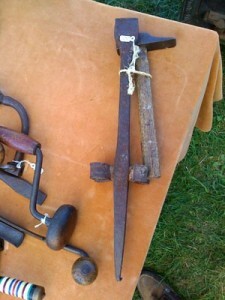 Many buyers of antique wood-related tools are green woodworkers and hedgelayers, but many are also bought by people who work in their own woodland. Some buy drills, planes, scribes, and draw-knives as ornaments - in most cases buyers prefer to restore and sharpen the blades themselves. Often these antiques are over 100 years old so that sometimes the wooden handles have been attacked by woodwork and need replacing. 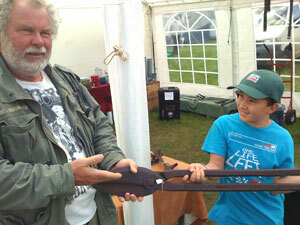 Buyers are also attracted by the range of old axe blades and because of their unusual shapes these have been especially popular with people doing battle re-enactments! If you are handy, you can build a lot of cool things out of wood. Even if you do not know how, you can get a lot of woodworker plans online. You can download them, and start building stuff right away. There are a number of sites with good woodworking plans. What a waste of a draw knife to use it for debarking – a billhook would be better – in France they made a large ‘billhook with two handles’ type of draw knife for this job… Not all tools should be used to the point of destruction – my collection is an ‘archive’ which I hope will be of benefit to future generations – it is very useful to know what an unused tool looks like, especially one like a billhook, which over years loses its original shape with re-sharpening…. Book images, or photographs, do not convey the same information that you get with physically handling a tool. 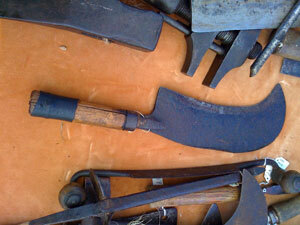 I was thrilled with the tools Ian sent me, its so nice to see that someone is recycling these tools at a great price. many thanks for a informative and helpful article. In case anyone is inspired by this article (! ), I still have one place available on my Hand Tools Maintenance Course on 6th November – covering mending, rehandling and sharpening tools. Details on my website – http://www.underwoodsman.co.uk. Last time I used a drawknife last Tuesday: first time I used a drawknife, last Monday – debarking freshly felled chestnut. Having lived in the countryside all my life I am being taught green woodworking for the first time, it is fantastic. I need tools and I will be looking to buy quality used that like me are ready to work, (currently unemployed). Great article thanks for even more inspiration. An interesting article. Pleased to note that the price of the tools Ian sells is cheap. Some antique tools are so expensive that they are not affordable and it is important to be able to acquire these tools so that they can be used, not just kept in a display/museum for people to look at. When was the last time you used a drawknife?